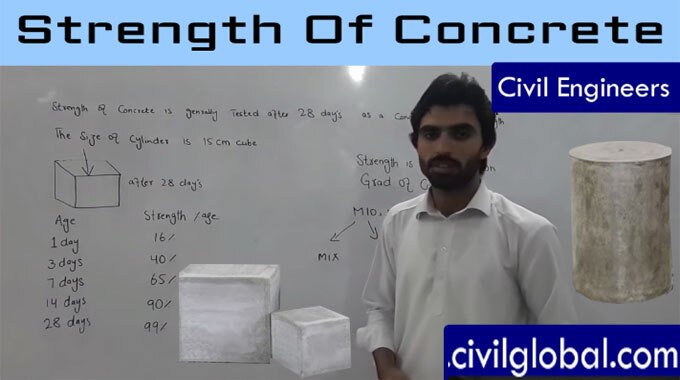 This construction video tutorial briefly explains the strength of concrete. The testing is generally done after 28 days for checking the strength of concrete like a concrete box cylinder strength. The size of the cylinder of concrete box should be 15 cm cube. Strength of the concrete is also affected by grade of concrete i.e. M10, M15, M20, M25 etc. Besides, other factors upon which the concrete strength is dependent range from quality of raw materials, proportion of water & cement, proportion of coarse & fine aggregate, proportion of aggregate & cement, age of concrete, compaction of concrete, temperature, relative humidity, curing etc. Here M denotes general mix and 10 denotes characteristic of compressive strength in N/mm2. Concrete compressive strength requirements can differ from 2500 psi (17 MPa) for residential concrete to 4000 psi (28 MPa) and greater in commercial structures. Higher strengths equal to and surpassing 10,000 psi (70 MPa) are indicated for specific applications.